STRANGE, Sir THOMAS ANDREW LUMISDEN, judge; b. 30 Nov. 1756 in England, probably in London, second son of Robert Strange, a prominent engraver, and Isabella Lumisden; brother of James Charles Stuart; m. first 28 Sept. 1797 Jane Anstruther in London; m. secondly 11 Oct. 1806 Louisa Burroughs, and they had a large family; d. 16 July 1841 in St Leonards (East Sussex), England. 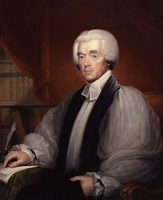 Thomas Andrew Lumisden Strange entered Westminster School, London, in 1769 and Christ Church College at Oxford in 1774, graduating from the latter institution with a ba (1778) and an ma (1782). Admitted to Lincoln’s Inn in 1776, he was called to the bar in November 1785 and four years later was appointed chief justice of Nova Scotia. Strange’s appointment might be explained by his mother’s friendship with Lord Mansfield, a former cabinet minister. The nomination came during a dispute between the Nova Scotia House of Assembly and the Council, in part involving charges of partiality against justices James Brenton* and Isaac Deschamps* of the Supreme Court who had presided in the absence of a chief justice. Strange’s main task on his arrival at Halifax in May 1790 was to conciliate the warring factions, which he found anxiously watching him. To that end he dined “with every one who invited me,” including Jonathan Sterns, a lawyer whose suspension by Deschamps had been an early event in the so-called judges’ affair. Strange reinstated Sterns and managed to establish friendly relations with Brenton and Deschamps, whom he found “very amiable, deserving persons and of great assistance to me.” His tact, the passage of time, and the diversion created by the war with France in 1793 resolved the crisis. Despite his evident popularity, Strange became unhappy in Nova Scotia. In 1794 he expressed dissatisfaction with Wentworth and “the Habits of his Family,” an apparent reference at least in part to Wentworth’s morals. 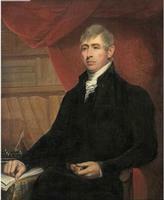 He also alleged that Wentworth had not been open with him “in his views of Government.” That year Strange sought the chief justiceship of Upper Canada, and expressed a desire to embrace “the first opportunity of quitting this place.” In some measure, Strange wanted a move for financial reasons. His salary was to have been £1,000, with £200 to come from fees. But he discovered that the fees “consisted of small sums, to be received often from very indigent people, who could but ill afford to pay them,” and he had found deriving any of his income from such a source disagreeable. From time to time Strange gave some of the £200 fee money for a law library, and then contributed to a collection of books “of a more popular Nature” for the town. In 1795 Strange stopped seeking the appointment in Upper Canada and instead requested permission to tour the United States when the war with France ended. His desire to get away may have been strengthened by his feelings of loss after his close friend the Reverend Andrew Brown* departed for Scotland that year. On 25 July 1796 Strange himself left for England. Although he indicated that he was only going home for a visit, as he had in 1791, he was apparently not believed. In 1797 he informed Wentworth of his intention to resign. A year later he went to Madras (India) as recorder and president of its court. He was knighted on 14 March 1798, before his departure. 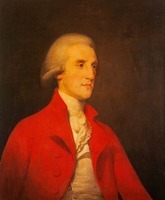 In 1800 he became chief justice of the Madras supreme court, over which he presided until his return to England in 1817. He also wrote Elements of Hindu law (2v., London, 1825), for many years the definitive work on the subject. As chief justice in Nova Scotia, Strange’s achievement in keeping the peace and winning respect for the Supreme Court was no mean feat. Blowers’s observation that Strange was “a most excellent theoretical lawyer,” but had practised little and once made an error in a trespass case which he had had to point out, seems petty in view of the praise Strange received from many quarters. PANS, MG 1, 480 (transcripts), 1595–613; RG 39, HX, C, 1790 (A–K), 1792 (S–Z), 1793 (A–Z), 1794 (A–H). PRO, CO 217/36–37, 217/62–67 (mfm. at PANS). Royal Gazette and the Nova-Scotia Advertiser, 1790. DNB. Cuthbertson, Old attorney general. R. W. Winks, The blacks in Canada: a history (London and New Haven, Conn., 1971). Margaret Ells, “Nova Scotian ‘Sparks of Liberty,’ Dalhousie Rev., 16 (1936–37): 475–92. J. E. A. Macleod, “A forgotten chief justice of Nova Scotia,” Dalhousie Rev., 1 (1921–22): 308–13. T. W. Smith, “The slave in Canada,” N.S. Hist. Soc., Coll., 10 (1896–98): 1–161. Donald F. Chard, “STRANGE, Sir THOMAS ANDREW LUMISDEN,” in Dictionary of Canadian Biography, vol. 7, University of Toronto/Université Laval, 2003–, accessed April 26, 2019, http://www.biographi.ca/en/bio/strange_thomas_andrew_lumisden_7E.html.